Colourful Óbidos is one of Portugal's must-see medieval hill towns. White washed, apart from the colourfully painted doors, this historic centre is still surrounded by its protective castle walls. The medieval castle (which looks like it's straight out of a Lego kit) occupies the highest ground and is a striking focal point of the town. 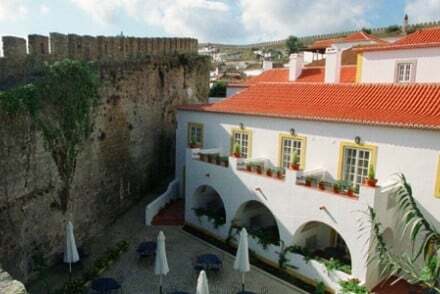 Now turned into a pousada, an historic hotel owned by the Portuguese state, it is certainly one of the best places to stay in Óbidos. The walls date from the Moorish period, and walking along, or atop of them, is one of the best ways to see the city and its beautiful, lush surrounds. Óbidos also has a 3km long aqueduct, built in the 16th Century, which is worth a stroll along. If you're looking for it, it's just to the south of the main gate, Porta da Vila. As with many old towns, some of Óbidos's most beautiful architectural structures were built for worship. The Igreja de Santa Maria was converted from a Mosque, which was built on the foundations of a Visigoth temple, so this spot has been a significant sight since ancient times. Several restorations later it's now an elegant Renaissance style building, famed for its hand painted tiles, art, and for hosting the 1444 marriage of a then ten year old Alfonso V. The Igreja de Santa Maria is home to several artworks by Josefa de Óbidos, whose work is also celebrated in the Museu Municipal. Óbidos has a lagoon very nearby where you can swim, sail or birdwatch, and it is only 17kms from a lovely stretch of coastline. Óbidos has many festivals, celebrating everything from its medieval heritage to chocolate, and if you visit during festival time you'll see Óbidos at its most colourful. Our selection of the best places to stay in Óbidos all reflect the town's rich architectural heritage. 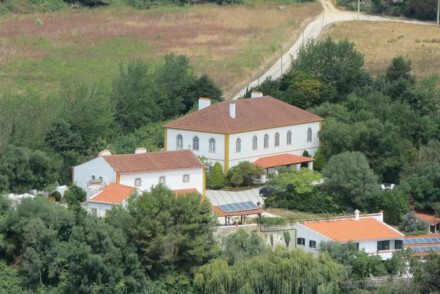 In amongst the ramparts, Casa das Senhoras Rainhas is the perfect choice if you want to be situated within the walls. It is also close to the lagoon. So there's plenty to do within walking distance. A historic townhouse, now a fresh, chic hotel. The ten rooms are very reasonably priced, ideal for those on a budget. 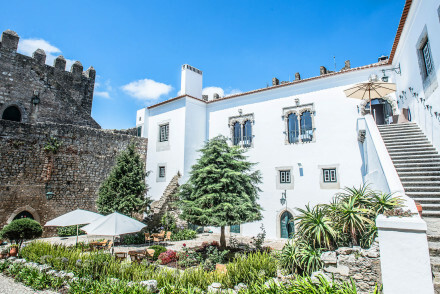 Awash with historic charm, Pousada de Obidos is a stellar hotel in the heart of the city. Its rooms exude a simple elegance and are decorated with beautiful furnishings and tasteful artwork. Beautiful views and an atmospheric setting make this a standout option. Casa d'Obidos is just a short way out of the centre of Obidos and a great option for families. With a selection of lovely rooms and apartments that sleep up to six, it's an excellent choice for people looking for a quiet spot away from the bustle of the city. Half an hour south of Obidos, Areias do Seixo is a luxury beachside eco hotel. Come here for great attention to detail, a top notch spa and Lugar da Horta Restaurant which serves local specialities. The nearest airport to Obidos is Lisbon (54 miles). The easiest way to travel from Lisbon is by car or taxi however reasonably priced buses and trains are also available. If you're looking to hire a car, click here for the best rates and booking details. The best time to visit Obidos is from June to September, when the temperature sits comfortably in the twenties. Browse though our list of all the best places to stay in Óbidos. Otherwise you can call or email one of our gurus for advice. Alternatively check our recommendations in the Alentejo.